Departing from the theme Asia Time, the curatorial team invited 47 artists and artists groups to participate in the first edition of the Asia Biennial / fifth edition of the Guangzhou Triennial. In a world dominated by a global “World Time” awareness, Asia Time focuses on a local understanding of Asian time. Firstly, it intends to give an impetus to a topical way of thinking about time that comes from the arts. But at the same time, the historical and current context of Guangzhou will be involved as a starting point for searching alternative models and multiple perspectives able to better articulate the notion of “Asia Time.” Subsequently, new modes of thinking about Asia will emerge going beyond geographically and historically defined concepts. Adel Abidin (Iraq/Finland); Airan Kang (Korea); Anya Zholud (Russia); Armin Linke (Italy/Germany) and XML (The Netherlands); Bani Haykal (Singapore); Bei Douxing (China); Body Group (Saara Hannula in collaboration with Tommi Antero, Robert Allen, Rachel Fain and Carmen Wong – Finland/USA); Bu Bing (China); Chiharu Shiota (Japan); Ella Raidel (Austria); Esther Shalev-Gerz (France); Fu Wenjun (China); Geumhyung Jeong (Korea); ½ Q Theatre (China, Taiwan); Ho Tzu Nyen (Singapore); Hongjohn Lin (China, Taiwan); Hu Xiangcheng (China); Jalal Toufic and Graziella Rizkallah Toufic (Lebanon); Jan Kaila and Japo Knuutila (Finland); Indieguerillas (Indonesia); Jan Simon (Poland); Job Koelewijn (The Netherlands); Kyungah Ham (Korea); Leung Mee Ping (China,Hongkong); Liu Yue (China); Melati Suryodarmo (Indonesia); Ming Wong (Singapore); Nasrin Tabatabai and Babak Affrassiabi (Iran/The Netherlands); Natascha Sadr Haghihian (Germany); NC Group (China); Omer Fast (Israel/Germany); Pei Yongmei (China); Praneet Soi (India/The Netherlands); Rayyane Tabet (Lebanon); Sara van der Heide (Korea/The Netherlands) in collaboration with a.o. Liu Ding, Dongyoung Lee, Chan-Kyong Park, Johannes Schwartz; Saleem Arif (India/UK); Sarah Sze (USA); Siren Eun Young Jung (Korea); Susan Pui San Lok (UK); Tiong Ang (The Netherlands) in collaboration with Alejandro Ramirez, Dongyoung Lee, Louwrens Duhen, Sinta Wullur, Robert Wittendorp, Heekyung Ryu, Ingrid Edwards, Hiroomi Horiuchi and Atone Niane; Wang Wei (China); Yu Xuhong (China); Yuan Gong (China); Yamashiro Chikako (Japan); Yue Minjun (China); Zhang Xiaotao (China); and Zhou Tao (China). More information about the project and the opening programme will be forthcoming in mid-November. 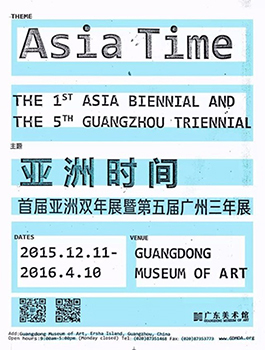 Tags: asia, asia biennial, exhibition, symposium, time. Bookmark the permalink.